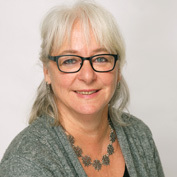 Christine Fournier, BSc RN, DAP, has worked in mental health and geriatrics as a clinician, manager and project manager. She has held positions at all levels of the continuum of care and services; from the community sector to second and third line specialized services. For the past four years, she has been project manager in the territory of the RUIS Université de Montréal for the implementation of the Ministerial Initiative on Alzheimer’s Disease. As such, she is responsible for the support and management of projects according to MSSS guidelines and recommendations contained in the action plan on age-related cognitive impairment. She holds a BSc in Nursing from the Université de Montréal and a DESS in Management from the École nationale d’administration publique. She has helped organize scientific symposia and has collaborated on various research projects designed to contribute to the well-being of people with major neurocognitive disorders and their families.